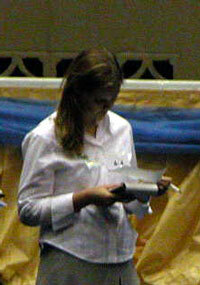 Yesterday I posted a story about the college judging competition and a picture of Lindsay Spencer. Well, today I got to meet her and I interviewed her about how she got involved in dairy judging. This is actually her second competition! So she’s certainly off to a great start and competing with the best of the best here at World Dairy Expo.